Last September, Forbes announced its annual ranking of "Hip-Hop Cash Kings." Drake finished No. 3 on the list (his highest spot to date), raking in $39.5 million. Only Diddy and Jay Z took in more. Today Forbes published another list, this time focusing on rappers' wealth rather than their income. Again, Drake is behind Diddy and Jay Z in this category; he also lacks the fortunes of Dr. Dre and Birdman. But for the first time in the Toronto rapper's career, he is one of the five wealthiest rappers. 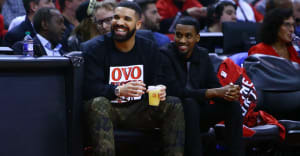 Between cash, property, and deals with Nike, Sprite, Virginia Black, and Apple, Drake's worth comes to $60 million. The rapper told Forbes that getting into the top five was "pretty much my objective every year. Other than making good music." See the full rankings here.